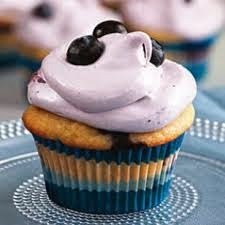 Here's a recipe or blueberry cupcakes that has a secret ingredient for the cake -- mashed potatoes! The potatoes make the cake incredibly moist, and the frosting is so guilt-free that you can pile a lot on each one. Note that the frosting stiffens just about as soon as you mix it, so be sure frost the cupcakes right away.